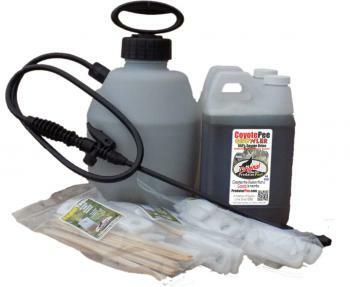 Perfect for protecting large areas, this jumbo size pack includes five 64 oz Growlers of 100% Pure PredatorPee® Coyote Urine - the equivalant of 20 16oz bottles, a reusable 1 gallon heavy duty sprayer, and 14 packages of PredatorPee® Scent Tags. Create a "Pee-remiter around 4 acres or 1600 feet! This is a great savings over single item prices. Protect your gardens, shrubbery, chickens in a big way with this all natural repellent!